New York-based Docurama (www.docurama.com), a division of New Video, specializes exclusively in documentaries. Among its many titles are A Decade Under the Influence (Richard LaGravenese, Ted Demme), Lost in La Mancha (Louis Pepe, Keith Fulton), Children Underground (Edet Belzberg), Southern Comfort (Kate Davis), and Brothers Keeper (Joe Berlinger, Bruce Sinofksky). ID talked to Docurama President Steve Savage. What's your process in acquiring documentaries? Steve Savage: In our arena, there are two things: finding great films and selling great films. So we do everything to be able to accomplish those goals. We go to film festivals, we track things on the Web, we go to parties, we speak to people, we get things early on, we get things late. It's sort of an all-points bulletin. When you're tracking these films what do you look for? DVD continues to be an ancillary medium, meaning that things don't start out on DVD; they end up on DVD. Part of what makes a film work for us and the filmmakers is the way that the film builds its stature. We call it the pedigree of the film. And that is the reviews, the festivals it has played, the articles and profiles. You see a film that you hear about and you watch it grow. It needs to grow and be nurtured so that when it hits DVD, people know about it. You talk about the pedigree of a film; how does the Docurama team develop a strategy for exploiting this pedigree and getting the film out to the marketplace? We have a team of about 30 people who will begin with a research phase where they talk to everybody and read everything that they can, and obviously watch the film. They try to understand how this film is going to look and feel and what it's going to take to open up the largest possible market for the film. That's followed by a marketing plan, which puts down all the stuff that we can possibly think of. That way the sales people, the marketing people, the designers, the publicists, everybody can get on the same page and understand why this film is special and who this film is for. So the marketing plan is sort of the dossier that drives the entire process. Some things we figure out early in the phase and other times we send the film out to customers and they feed back to us what they thought wasn't right with the way we were presenting it. We work with all the major retailers—Tower, Borders, Barnes & Noble, Best Buy and even the warehouse clubs. They know, sometimes more than us, about what we have, and they sort of help us with how it's going to get out there to the marketplace. How do you involve the filmmaker at this stage? The greatest successes we've had have been when the filmmaker has stayed with us during the entire release process—been available not only for publicity, promotion and speaking to the media but also for helping us shape the product. They help us inform ourselves about who has responded to the film up to that point, where the special markets are and who the people are who can help us develop it. What about producing the DVD itself? Working with the filmmakers, we gather what would be the added elements and commentary tracks. Our goal with a lot of these important films is: "Imagine being able to watch these films 100 years from now." With the commentary track you'll be able to watch the film sitting beside the filmmaker. That's a tremendous gift. There have been some films where we've needed to strike a new print from the internegative because all the master materials didn't meet spec. Then we have to do the transfer from there. And of course, as a distribution company we don't have the elaborate post-production facilities on our premises; we have to work with specialists. Sometimes we have to do the sound completely over, sometimes it's restoration problems, sometimes it's equalization and color correction. DVD is a very unforgiving format in that things that looked just fine on VHS five years ago just don't cut it anymore. We have to answer to a much higher standard so that people can see the film in the best possible light. As documentaries have enjoyed a surge in popularity over the past few years, how has business been for Docurama? When we started Docurama we found that the film festivals that had both fiction and nonfiction components also had a tremendous amount of energy surrounding documentaries. We've always loved documentaries, but to think that there was a business there three-and-a-half years ago might have been pipe-dreaming on our part. However, we were sensing that there was something going on at these festivals, and we had an expectation that it was going to cross over to mainstream audiences. What happened this past summer is a confirmation of what was driving us to get to the 50th film that we've released, and also gives us renewed conviction to go forward. Every year we've seen our business double; this year it continues to grow. Our motto at Docurama is "Everything Else is Pure Fiction." When you look at the films that have broken through—Spellbound, Capturing the Friedmans—all of these films would never have survived a Hollywood pitch meeting, yet audiences are responding to them. It's a really thrilling time to be in the distribution business of documentaries. The Criterion Collection, also based in New York, is renowned for its formidable lineup of the works of the masters of world cinema. Criterion's documentaries include such classics as Night and Fog (Alain Resnais), Salesman (David and Albert Maysles, Charlotte Zwerin), Monterey Pop (DA Pennebaker), Gimme Shelter (David and Albert Maysles, Charlotte Zwerin) and Grey Gardens (David and Albert Maysles, Muffie Meyer, Susan Froemke, Ellen Hovde). ID spoke with Kim Hendrickson, an executive producer with Criterion. Talk about what a DVD producer does. Kim Hendrickson: A producer of a disc is essentially assigned a title and is responsible for all aspects of production of that particular DVD, from supervising the film transfer to packaging design through liner note assignments and transferring of elements and several little features. The producer is responsible for the whole process. So when you take on a project, such as Gimme Shelter or Monterery Pop, what's the process? What's the extent of the filmmakers' involvement? For both Gimme Shelter and Monterey Pop, we went back to the original 16mm camera negatives and transferred from those directly. Essentially the filmmakers are involved in every aspect. They're the original archivists of these materials, so we go back to them for the best elements that they can possibly deliver. Thereafter, the mission statement of the company is to present films as the filmmakers intended them to be presented. So we would never go in and make decisions based on aesthetic choices, colorization, framing and so forth without the filmmaker being involved—if, in fact, they're around and alive—and in our case they have been. So what happens is that we go back and retransfer all our films into high definition. There are supervisors who do the color correction, a supervisor on behalf of Criterion and the filmmaker to approve, disapprove or otherwise make suggestions. But we shoot all of our supplemental material on digital video. What about getting these DVDs to the end users? 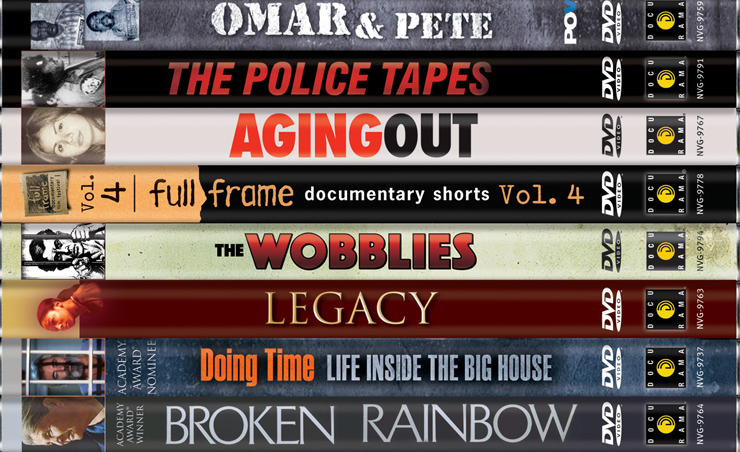 Our DVDs are sold in all the mass-market stores, online and at all the big retailers. You can find some of them at Blockbuster, but they're all on Amazon and in Virgin and Tower and all the major retailers. We also have a website (www.criterionco.com), which indicates where you can find them if you can't find them online or in your local store. Some titles sell in the tens of thousands, some in the thousands, but that doesn't take away from their individual merit as important films. One of the things that's important to us—and if you look at our titles you can see this—is that there's always an intent to capture the nuances of the time and period of the film in some kind of aesthetic way. So if you look at the packaging of Gimme Shelter, you have this iconic artist, Frank Kosic, creating new art for the film, which never really had a specific image that was associated with it in terms of its presentation to the world. Same thing with Monterey Pop. We wanted to find something that was contemporary but had a kind of '60s feel to it. It's all thought out within the type of film that we're working on. We think more about that than key quotes on the front. Talk about the economics of transferring from film vs. transferring from video onto DVD. As a matter of fact, I think that one of the reasons that people appreciate Criterion and continue to support our endeavor is because we don't do that. I'll give you an example. Three or four years ago we were working on the Maysles' film Salesman. We had a done a new transfer of the film from the original 16mm negative. The DVD encode that was produced out of that didn't look very good. When films have been shot on 16mm, they're very grainy, but there's a process in DVD transfer where you can reduce the amount of grain-reduce the noise, so to speak. But it appeared on this particular film as digital noise. You could tell it wasn't film grain anymore. We actually went back and transferred the film again so that we could start over. So we will always do the things that are the most important for the film. We did the same thing on Monterey Pop. Not only did we go back to the 16mm A/Bs, we had Eddie Cooper, who was Jimi Hendrix's original producer and sound mixer, go back to the original 8-track audio tapes and remix all of those for us in 5.1. So we're more driven by the materials that we have and what needs to be done to present them. Facets Multi-Media (www.facets.org) is a Chicago-based nonprofit media arts organization. Besides its film and video programs, it has a video/DVD label, Facets Video. ID spoke with Ray Privett, distribution coordinator for the Facets Exclusive Collection, an assemblage of some 400 titles, 20 percent of which are documentaries. What's the acquisition/selection process for Facet's documentary titles? Ray Privett: How we actually acquire things can depend on so many different factors. We do go out looking for films, but films also come to us. We look for films at festivals, other distributors, and we work a fair amount with places like Arte in Europe. We release a fair amount of documentaries that Arte is also releasing in Europe; we just take the product into the US market in NTSC format. How do you work with filmmakers? Oftentimes a filmmaker's best friend is himself. Non-exclusive distribution is much easier for a filmmaker to acquire through us. It doesn't necessarily translate into as many sales, but you can do it. What that means is that you get the film listed in our catalogue and you act as your own distributor when somebody wants to buy it. You have to take care of all the necessary rights issues, all the packaging. But that can be done in a way for Facets to be a database or a servicing house for filmmakers and their documentaries. That's not always how the process works, but we've done it with a very nice DVD called True Life Video Stories, which was made by Scott Jacobs. When DVD came along, he found a way to take the footage he'd shot during the '70s and produce the DVD himself, so he did. He even duplicated it himself, and we sold it for him. I think this way of doing things makes a lot of sense for independent filmmakers because it allows a degree of control over the final product that filmmakers almost inevitably want. It also makes it so that distributors, who are mostly salesmen more than producers, can just take the product, make the promotional material and sell it. I know a lot of different companies don't work that way, but as a sort of paradigm I think it's a good thing for independent filmmakers to have at their disposal. Has the recent boom in interest in documentaries spurred sales at Facets Multi-Media? There's no question that Capturing the Friedmans, Spellbound and Bowling for Columbine have drawn media attention to documentaries, but in some ways that has more to do with the marketing might of the distributors who acquired them. In terms of our own sales, yes, our documentary sales have gone up but that could be because we've also strengthened our sales teams. What is the cause and what is the effect? Is it because of our sales team or other documentaries getting a lot of play in theaters owned by Landmark? It's a complicated algebra. Will DVD continue to thrive as a means to revive and preserve documentaries? In terms of the format, DVD is not perfect. There are very serious issues, such as compression, which will hopefully be addressed with the next generation of DVD. With the vast majority of DVDs, when they are made, the video and the audio are compressed so that frames are dropped, and the compression algorithm grabs onto key frames. So it's not as if you're perfectly preserving the film. Even if you transfer a movie directly from a 35mm print onto a Digi-Beta tape under the best possible conditions, you will lose something when you compress the Digi-Beta onto a DVD. It's great that the DVD is making all these works available in what is potentially a longer standing medium. However, I think that there is a danger in saying that these works will be available forever now that they're on DVD. It's an imperfect product because of key framing and audio compression. So the Digi-Beta or the 35mm film print, if it can be preserved well, is still a better representation of the work from which the next generation of digital media can be created. Very few works are made that are intended to be seen on DVD. When you're shooting [a film], you're not thinking in terms of the ratio and compression algorithms; you're thinking about something else. But the DVD is often the ultimate product, the most common representation of the finished work. So it's important to realize that there's not always a perfect transposition from one medium to the next. Patricia Troy is a Los Angeles-based freelance entertainment journalist.